Because of his sickly disposition, Moses likely spent much of his early years in the company of his mother, where he lent his time to reading and study. At the age of six, his parents enrolled him at the local schoolhouse under a Mr. McKown. On account of his health, many supposed that he would not be able to handle the three mile distance between home and school, and while it was difficult, he did manage to attend more than half the time, to which his teacher ascribed him as being a “half scholar.” Even at such a young age, Moses showed a promising intellect. In only six months, he learned to read and write with suitable proficiency, far exceeding his full-time classmates. In 1778, the future of Moses Waddel’s education coincided with the large scale events taking place in the colonies at large. During that year, Reverand James Hall sought to establish a grammar school in the area, particularly to serve the small cluster of parish churches scattered among the North Carolina backwoods outside of Charleston. However, the Revolutionary War was by then in full force. Even still, they faced the first difficult task of procuring the sufficient means, and actual students, to establish the school. There were some acquaintances of William Waddel, Moses’ father, who were active supporters of the school, and encouraged William to enroll Moses as a scholar. There, he would gain a classical education: learn Latin, Greek, be trained in philosophy and mathematics, and learn other skills necessary for a professional vocation. At first, William thought the proposition was absolutely “absurd,” as they were a poor family with little extra to afford books and tuition. However, after seeking out council from respected neighbors, William took to “confiding in the providence of that God who had always provided for him in his difficulties” and allowed Moses to enter. Nicknamed “Clio’s Nursery” by Rev. Hall, the school was established on the north side of the South Yadkin river, and began its first session in October, 1778. That first class of students was comprised of five other boys who would later become prominent men: Edward Harris, a judge of the superior court of North Carolina, ministers David Purviance and Richard King, and doctors James Nisbet and Joseph Guy who also served as representatives in their State Legislature. In 1779, Francis Cummins, at that time a student and ministerial candidate, took over the instruction of the school. Years later, Mr. Cummins would deliver the sermon at Moses Waddel’s ordination service into the ministry. For those first few years the work of Clio’s Nursery was a prosperous endeavor. 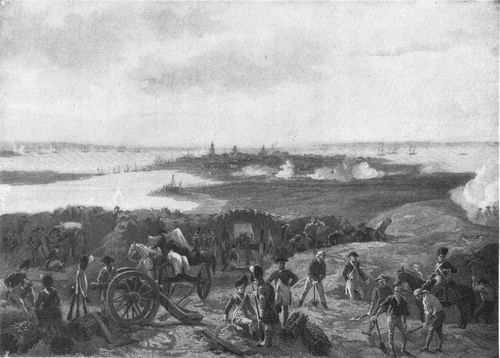 But on May 12, 1780, news reached that Charleston had surrendered to the British Army, and subsequently, the school was suspended until the spring of 1782. With sound guidance and an eager mind, despite the many obstacles and hiatuses, Moses Waddel eventually completed his course of study by his fourteenth year. Not long after completing his schooling, a man in Camden, SC inquired to Dr. James Hall for a skilled linguist who could teach Latin to his pupils. Having immediately thought of Moses Waddel, he inquired to William to allow his son the opportunity. Nevertheless, when a newly established school closer nearby sought a teacher, William allowed his son to accept a position. At fourteen years old, Moses established himself at his first teaching position with a salary of seventy dollars a year, teaching to a small class of less than a dozen students just beside Hunting Creek in current-day Iredell County, North Carolina. Once again, however, his health got in the way and many times over the next several years, he was forced to return home. When he resumed teaching, he offered his services to disparate areas of the wooded Carolinas and even accompanied a prospective tour in 1786 to Greene County, Georgia, which was then a wooded, unclaimed frontier. He seemed to find renewed vigor from visiting Georgia and attempted to persuade his parents to move with him. They had already entertained the thought, but were hesitant to make any rash decision of moving the family, and wished to have Moses remain with them a bit longer as his health required. Moses, however, seemed to have been feeling the restlessness of youth, and in an act of defiance, he left on his own to Georgia. Bethany Presbyterian Church located in Green County, Georgia was in its beginning stages when Moses attended. He likely never attended the current structure, but it does remain a church and cemetery even today. By the time Moses was in his late teens, he interacted little with the religion of his parents and forefathers an ocean away. While he was likely baptized as a child and made profession of faith in his youth, daily acts of piety were but the general manners he was taught and expected to perform by those around him. In his time in Greene County, Moses took up habits of a seemingly rebellious nature. He took to attending parties weekly, staying up late to drink and dance and participate in otherwise unsavory conduct that would often catch Moses in regret and anguish after the fact. Even as he attempted to correct his disorderly behavior, it did not fill a void. He grew to be a respected member of a nearby church and community, yet he still felt a wrestling within himself. Moses had lost his sense of identity, and was wandering aimlessly-playing out the motions of life but to no satisfaction. It certainly didn’t help that he was removed from the friends and family of his youth, and that perhaps everyday life had become mundane, and served no purpose. His lack of assurance often turned into terror of his fate-that he was a lost cause. His son relays an anecdote of a time that greatly shook Moses to his core. While the story, on one hand, begs a small laugh, the reality was that it prompted Moses even further into his exploration of self and God, and ultimately opened up to a path to his future as one of the most influential ministers of his time. Thereafter, Moses felt an inescapable draw to the ministry, and under conviction set aside his duties as a teacher and left the wilds of Georgia for Prince Edward County, Virginia. At the College of Hampden-Sydney, he completed his seminary education in September, 1791. Shortly following, in May, 1792, Moses was licensed by the Presbytery of Hanover (Virginia) and later received in 1793 by the Presbytery of South Carolina. In his early years as a preacher, he moved around a lot. He preached interchangeably along the coastal region near Charleston, particularly James Island, Johns island, Wadmalaw island, and Dorchester. He also often provided supply at Carmel church in Georgia, where he was officially ordained in April, 1794, with his former teacher, Francis Cummins, delivering the ordination sermon. Around this time, he also returned more steadily to teaching at a school in Appling, Georgia. At this point in his life, Moses seemed to have found his purpose in ministry and teaching both, as he served the disparate areas of South Carolina and North Georgia. The pangs of his youth seemed but a distant memory, and a new happiness awaited him. But as is often the case in a time of overwhelming comfort, it was not to last for long. While near Appling, Moses accepted a call to provide pulpit supply across the Savannah river, in Abbeville, South Carolina in what is known as the “Calhoun Settlement.” Here, the now-prominent American family resided and attended Long Cane Church, where Moses sometimes preached. At the time, future United States Vice President, John C. Calhoun, was just a boy. His father Patrick Calhoun, a prominent member of the community, once invited the new minister, Moses, to dinner. There, Moses was drawn to Catherine Calhoun, the elder sister. Johh Newton Waddel writes, “She is described as having been a very attractive lady, and it seems the young minister was at once struck with admiration of her many charming qualities.” The continued visits and appearance of young Moses to the Calhoun residence in the following months seemed a little more than simple ministerial visits. And, indeed, just a year later, in 1795, the two were married. In the year following, Moses continued to enjoy his new married life. Soon, Catherine was expecting a child, and by all accounts, Catherine was an excellent help mate and partner to Moses, in matters of both home and vocation. Moses continued to provide pulpit supply when needed, and devoted much of his time to teaching, and particularly in tutoring his young brother-in-law, John, who now lived with the newly-married Waddels. By all accounts, it was a happy time for Moses. This time of prosperity would not last long, however. A popular anecdote of Moses’ life expressed an unusual foreshadowing of what was to come. Shortly before he had proposed to Catherine, Moses had a dream that he married Catherine and that she had died soon after. Though it certainly shook him at the time, it seemed only a strange nightmare that once had, quickly passed away. Little over a year into their marriage, Catherine died in childbirth and, even more painfully, Moses’ infant daughter followed soon after. Moses’ world came to a halt, and his worst nightmare had literally come true. He held irregular teaching periods at the school, and often took on preaching missions that had him wander for weeks through the thickest of brush and wilderness. Amidst his despair, he still continued to tutor John Calhoun during the next two years. He provided the necessary education that allowed John to pursue higher endeavors, such as being accepted into and graduating from Yale College. However, when his father-in-law Patrick Calhoun also died, Moses, still wounded in grief from the passing of his wife, suspended his teaching duties indefinitely. In this time, not much is known about the inner workings of Moses. He seems to have retreated into a time of mourning, in which he neglected the duties of teaching that he had once thrived in. James MacLeod speculates of his mental state, and his son John Newton Waddel only briefly covers this time, but what is evident is that Moses was deeply wounded. Likely in a state of mourning and depression, he found it difficult to tend to his work, and in this time his health also suffered. Eventually, though his mind and body were weak, he turned his attention to matters of the heart and soul. For a season, Moses ceased his labors as a teacher of academics, and instead turned full-time to his call as a teacher of the gospel. Joanne, thank you for these articles. I really do appreciate effort that goes into putting these together. I do have a question for you though. Have you come across any information regarding Moses’ relation to James “The Blind Preacher” Waddell? I ask because I’m a descendant of James’ uncle Joseph Waddell. I’ve heard several times that Moses and James were purportedly cousins. Just recently I came across a story that in Moses’ diary he notes that his first sermon was delivered to James’ congregation just days after he was licensed in 1792. There seems to be a connection but I just don’t know exactly where it is. Any help would be appreciated. I’m sorry I haven’t replied sooner! Life happens and I do genealogy in ‘bursts’ so it’s not always something I’m keeping constant track of. I’m glad you appreciate what I have so far. In regards to James the Blind Preacher, I do know of him and I believe Moses Waddel and he do overlap a bit as being contemporaries. I haven’t had an exact link, but I posit that since there really was a single Waddel line coming from Northern Ireland, that likely they might be cousins of some degree. There is about a generation missing in records between the William that fled to Northern Ireland initially from the shipwreck and the William that first immigrates to America, and perhaps the connection lies there. I don’t actually know much of William Waddel who arrived here, so perhaps he had siblings, even brothers, who may have also come to America. It’s possible family even encouraged him to come. You actually have a bit of Moses’ diary? I don’t actually know that I’ve come across his diary. I would love to know how or where to view it! Maybe we can get to the bottom of this, but I am fairly confident that they are related–it’s just a matter of degree.